What a great place to meet you! I am delighted that you and I are getting together on LitSite Alaska, an outstanding Web community for families, teachers and Alaskans of all ages. The wealth of information, insights and stories on this site will provide hours of fascinating reading for anyone who is curious about the wonderful history, diversity and traditions of Alaska and Alaskans. Young readers, especially, will find here a treasure trove of resources for discovering and exploring this magnificent state. 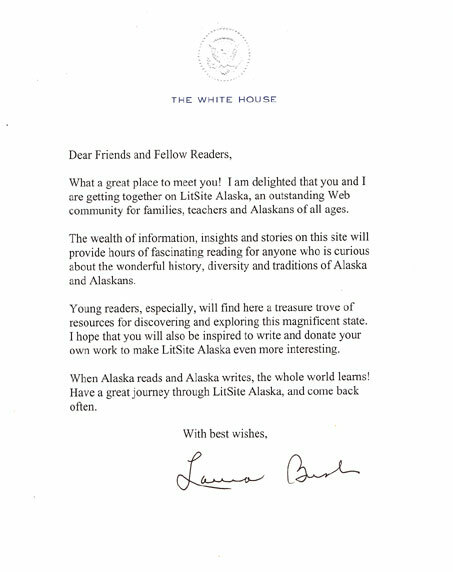 I hope that you will also be inspired to write and donate your own work to make LitSite Alaska even more interesting. When Alaska reads and Alaska writes, the whole world learns! Have a great journey through LitSite Alaska, and come back often.